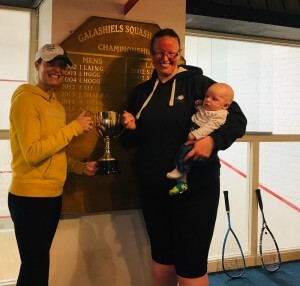 The Ladies Final had been long awaited and a highly anticipated dual as defending Champion Kerri Andrews came up against Debutant Sarah Chrystie. Kerri had a spell out of the game earlier in the year as she gave birth to a Boy- Fionnlagh, indeed Kerri has only been a mother for 12 weeks and is already competing in a squash Final having came through a gruelling Semi Final against Former Club Champion Rachel McAleese 3-2; this speaks volumes for the fitness and dedication of Kerri. Sarah was playing in her first tournament at the club having previously played for many years in Dubai and just recently moved back to Scotland – coming from a sporty family Sarah’s brother is Melrose RFC First team coach Rob Chrystie. The match didn’t fail to deliver top quality squash, although sarah took a 4-1 lead in the first game, both lAdies were quick out the blocks and any idea of starting slow and sussing the opponent out was non-existent. The pattern of the first game was whoever had the serve would score 4-5 points and vice-versa Sarah went 4-1, 4-4, 9-4, 9-10 then when Sarah got the serve back at 10-10 shhe seemed to find a different gear. Although Kerri was proving a formidable opponent Sarah would play the back-back-front game and the drop shots were proving decisive. Sarah motor on to 15-10. The second game went much the same, whoever had the sedrve would rel off several points on the trot. In this game it was Kerri who scored several points from some deft drop shots that Sarah just couldn’t reach. But sarah wa fit and covered the court well. Kerri got the serve at 13-12 down and unfortunately served out which dented her confidence and Sarah took the second a very close 15-13. In the third game Sarah wasn’t missing anything and Kerri fought Valiantly and refused to give up but Sarah seemed to have found her rhythm and the ball was going exactly where she placed it, this was 15-4 but the third game was just as scintillating as the other two. Match Umpire Del Sharratt said “That was one of the best matches I’ve watched for a long time, both ladies seemed to have kept their best squh for the big occasion. It’s particularly impressive that Kerri Andrews has just had a baby and is back playing at this level already, her enthusiasm and dedication is commendable. Sarah just joined the club early last year and has proved a major asset, the Ladies game has started to soar recently as we have attracted a couple of new lady members and hopefully the Ladies tournament can thrive over the neat year. A Big Well Done to Sarah Chrystie for her victory.